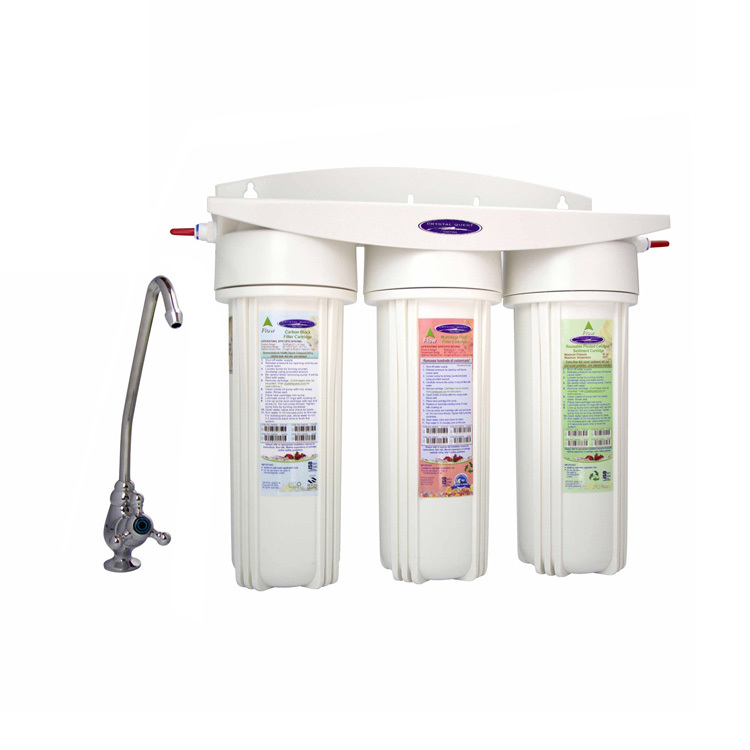 Undersink Triple Ultrafiltration Water Purification System with 8 stages that uses a UF membrane to remove bacteria and biological pathogens for areas such as well water. 3 cartridges that also feature a solid carbon cartridge, and our top of the line 6-stage cartridge containing the Coconut Shell Carbon(GAC) and KDF resin layers. UF utilizes a semi permeable membrane - a thin layer of material capable of separating substances when a driving force is applied across the membrane. It is a pressure-driven barrier to suspend solids, bacteria, viruses, endotoxins and other pathogens producing water with very high purity and low silt density. Solid carbon cartridge is for removing Volatile Organic Compounds (VOC's), insecticides, pesticides and industrial solvents. The added combination of Coconut Shell Carbon or Granulated Activated Carbon(GAC) and Eagle Redox Alloy media increases the systems' effectivity in removing hundreds of other contaminants from your tap water. This system is mainly designed for use with private wells but is also usable for tap or municipally treated water. Undersink water filter systems do not add clutter to your kitchen as it works behind visibility. 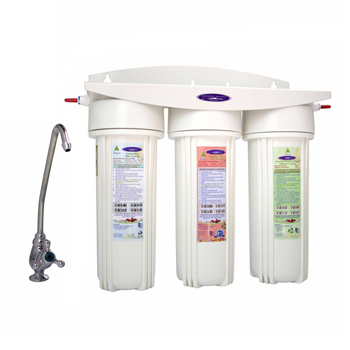 This compact, triple cartridge system is your best option to get reverse osmosis quality water without the tank and without any waste water. Ultrafiltration(UF) is an important purification technology used for the production of high-purity water. UF is effective for the removal of colloids, proteins, bacteria, viruses, parasites protozoa and pyrogens, (e.g., gram-negative bacterial endotoxins), and other organic molecules larger than .01 Micron size and most other water contaminations known today. Also removes pesticides and herbicides, as well as the hardness in water and salts. 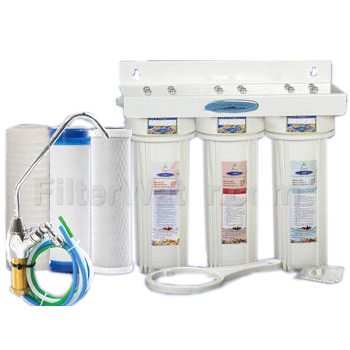 Ultrafiltration filter is required if water is biologically unsafe or may have bacteria or other biological contaminants. Triple cartridge, 8 Stage filtration process. One Ultrafiltration Membrane for better reduction. Carbon Block filter to fight volatile organic chemicals (VOC's) and other contaminants. Dimensions(LxHxW): 15"x14"(10"+4" to change cartridge)x5"
- This is a FilterWater.com original filter combo configuration. - Includes filter system, UF membrane, carbon block, 6-stage cartridge, faucet, filter wrench, installation hardware.